If a 6-speed manual is your prerogative for a new 718, opting for Sport Chrono doesn’t make much sense. Save the money for other options. The 2018 Porsche 718 range adds an impressive GTS variant to an already outstanding lineup. It should have been hard for the 2018 Porsche 718 to improve over last year’s model. Adding a higher-horsepower variant was a good place to start. Maybe it wasn’t hard after all? This year, the 718 adds GTS variants to base and Boxster S and Cayman S trim levels. Last year was the first year for the 718 Cayman and Boxster, which replaced the outgoing Boxster and Cayman models that lacked the area-code prefix. The styling didn’t change much; it still retains the same proportions and classic shape. It’s sharper and more muscular this time around, and inside is just as coddling with handsome hides and a straightforward layout. The 718 Cayman and Boxster offer a menu of turbo-4 powertrains with a new entry this year. 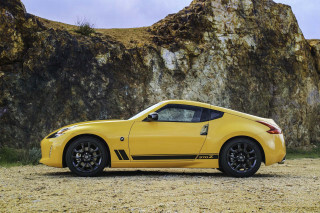 Base models make do with a 2.0-liter turbo-4 that puts out 300 horsepower, Cayman S and Boxster S versions bore the flat-4 to 2.5 liters for 350 hp. 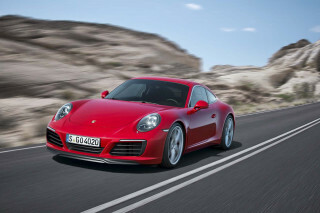 The GTS trim level is new this year and takes the 2.5-liter flat-4 from the Cayman S and Boxster S up to 365 hp. Performance at any level is impressive: base versions run up to 60 mph in 4.9 seconds, top-line GTS versions just need 4.4 seconds. There’s no bad pick for a transmission, either. A sharp 6-speed manual is standard, but a 7-speed automatic is just as impressive—and quicker. A good base suspension is made better with optional adaptive dampers and available torque vectoring that make the 718 one of the top performers on the planet. The 718s are like good dinner reservations: best kept for two only. The interior fittings are impressive, and probably worth the $56,350 entry money. Cargo space is scant—just 10 cubic feet split between the front and rear trunks. Don’t let that dissuade you. The power folding soft top in the 718 Boxster rolls down to reveal 90,000 feet of available vertical space for the bold. Porsche’s feature planning is just as impressive as the car itself. Lose focus and 718s can run up to six figures with leather everywhere, sport exhausts, and myriad color options. Keep your wits with you and a tastefully equipped 718 won’t break the bank, relatively speaking. When we dream of a two-seater sports car, it often looks like a 2018 Porsche 718. Think of a mid-engine, two-seater sports car and the 2018 Porsche 718—or something identical—comes to mind. It’s instantly identifiable as a Porsche Boxster or Cayman, the small shape isn’t jarring like it was 20 years ago. Its softer lines have been replaced by sharper lines in those two decades but there’s no hard feelings. Instead, the muscular look rises toward the rear end over the back wheels, and wrap up around a tidy tail. 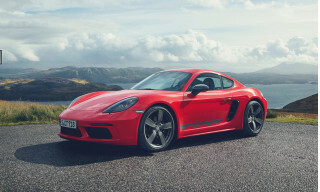 The 718 Boxster and Cayman were redesigned last year, and this year’s GTS addition only looks more menacing with standard 20-inch wheels and a ride height chopped by 10 millimeters. Inside, the 718 wraps its dash in high-quality materials including optional leather and offers a bevy of controls and switches for everything including performance and climate controls. It may seem overwhelming at first, but its steep learning curve quickly calms to keep eyes on the road while driving. In many ways, the 718 Cayman and Boxster are the benchmark to measure other sports cars. The 2018 Porsche 718 gets a 10 out of 10 for performance because we can’t give it an 11. This year’s news is the addition of a GTS trim level for the 718 Boxster and Cayman that moves the Porsche’s performance horizon higher—and brings the horizon closer to our windshields too. The 718 Cayman and Boxster start their lives with a 2.0-liter turbocharged flat-4 that makes 300 horsepower and 280 pound-feet of torque. Step up to the 718 Boxster S or Cayman S and that output grows to 350 hp and 309 lb-ft, thanks to a larger displacement. Both are improvements than the outgoing flat-6 engines, and sprint up to 60 mph in 4.9 seconds (Cayman and Boxster) or 4.4 seconds (Cayman S and Boxster S). Not enough? 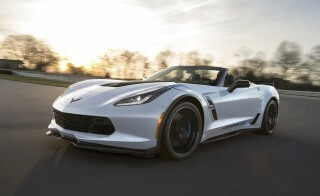 The new GTS variants bulk up with 365 hp and 317 lb-ft, and drop 0-60 times to less than four seconds. There’s an incentive to opting for S or GTS versions beyond outright speed. Both trim levels are equipped with variable geometry turbos that spool quicker and deliver power faster than base versions, which can lag. 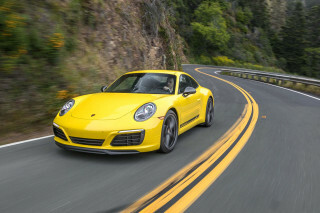 Regardless of powertrain, Porsche offers a crisp and direct 6-speed manual as standard equipment or a 7-speed dual-clutch automatic as an option. Porsche calls its Porsche Doppelkupplung automatic “PDK” for short and we suggest you do the same, it’s just cleaner—trust us. The 6-speed manual is as good as they come, the firm clutch pedal and short shifter work together like a rosined bow and tuned violin. The 7-speed PDK isn’t a fun-crusher; when combined with Sport Chrono, it launches the 718 toward the horizon cleanly and repeatedly, and “virtual gears” keep fuel economy in check by engaging two gears and finding room in the middle. The base suspension tune for its MacPherson’s front and rear is surprisingly good. 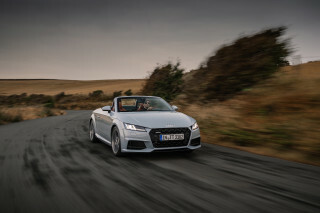 Opt for adaptive dampers, which are standard on GTS versions, and the system toggles between Normal, Sport and Sport Plus modes, with predictable degrees of firmness. Sport is taut enough to jiggle all the parts we don’t want jiggled, Sport Plus is best for track detail. At the wheel, the Boxster and Cayman benefit from Porsche’s institutional knowledge of electric power steering. It’s light and precise, with enough weight at 90 degrees and beyond to communicate to the driver what its nimble wheels are up to. New this year is a GTS variant that adds 15 horsepower and 8 pound-feet to the turbo-4 for a mildly more potent powertrain—on paper. Its lower than the base version by 10 millimeters as standard. 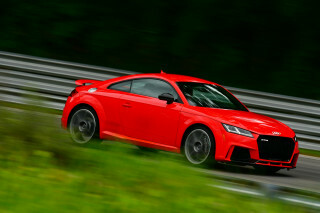 Optional suspension upgrades lower it a further 10 millimeters closer to the pavement, but doesn't harsh the ride much. Instead, the GTS brings driver closer to the experience with a louder intake (some piped into the cabin) and immediate turbo delivery that runs predictably up to its 7,500 rpm redline. The 718 GTS is just as sharp as a 911, with perhaps more predictable body movements. Read our first drive review of the 2018 Porsche 718 Cayman GTS here. Few cars are as comfortable for two as the 2018 Porsche 718. The operative word there is "two." The 2018 Porsche 718 doesn’t make any unreasonable promises about comfort. There’s room for two in surprising comfort with a glint of storage possibilities, provided you’re not at Home Depot. The 718 makes the most of its 97.4 inches between the wheels with generous room for two—but only two. Porsche offers four different seat types for the 718, from base buckets to sport seats with grippy synthetic suede, or premium thrones in plush leather. Regardless of style, each offers a firm fit without being too snug on our middle-aged backsides, and an adjustable steering wheel means that long legs and short arms isn’t a disqualification. In any configuration—even base—the 718 impresses with quality materials and excellent presentation. Throwing more money at a 718 doesn’t necessarily make it any more special; any day behind the wheel is a good day. Folding the Boxster’s power-operated soft top into the trunk, which can be done while the car is traveling up to 31 mph, makes it a great day. The 718 comes back down to earth in its storage. The Boxster soft top offers 5.6 cubic feet in the front trunk (aka “frunk”) and 4.4 cubes rear of the engine. The Cayman does better with 5.6 cubes in the frunk, 9.6 in the rear. Being pretty is rarely convenient. The 2018 Porsche 718 lacks a complete set of crash data. Sports cars such as the 2018 Porsche 718 are rarely crash-tested by either major safety rating agency. Their low production numbers and high prices mean that saving them from a wall is not only fiscally responsible, it also means more for us. Porsche bundles in the right hardware if things go pear-shaped anyway. 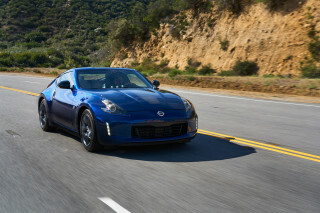 A full complement of front, side, and thorax airbags are standard, and a smart traction and stability control can reign in wayward rear ends to keep the coupe or convertible pointed in the right direction. A rearview camera is standard on all models, and S and GTS trim levels get front and rear parking sensors. Automatic emergency braking and other advanced safety features such as blind-spot monitors, adaptive cruise control, and active lane control are not available. Outward vision in the 718s is good—better with the top down in the Boxster, of course—and the car’s admirable maneuverability can help avoid crashes in the first place. Don’t blink or options for the 2018 Porsche 718 can push the car past six figures. Bring your wallet and an iron stomach to the 2018 Porsche 718. Although the models start at $56,350 for a 718 Cayman, or $58,450 for a 718 Boxster, their prices rise quickly. Customization options or performance add-ons can tack on tens of thousands of dollars to the bottom line. Paying more doesn’t always get more, so careful spending will net a good car in nearly every circumstance. Base cars are equipped with 18-inch wheels, sport seats with leather inserts, Bluetooth and USB connectivity, power features, a six-speaker audio system with a 7.0-inch touchscreen for infotainment. 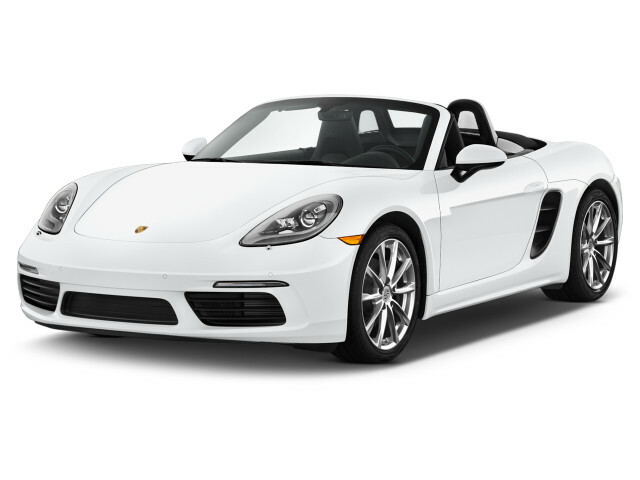 Boxster models are equipped with a power folding soft top. Boxster S or Cayman S versions are equipped similarly, but add 19-inch wheels, upgraded audio, and a Sport button. New for 2018, the Cayman GTS and Boxster GTS add more go-fast parts and a few niceties too. 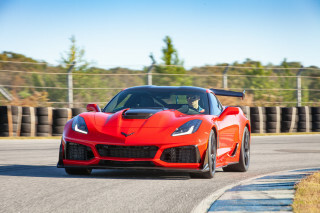 The GTS versions add to the S trim level 20-inch wheels, gripper synthetic suede or leather seats, torque vectoring, active suspension, a sport exhaust system, and a thick-rimmed steering wheel borrowed from the 918 that includes a drive mode selector that makes us feel like a Formula One driver on weekends. Kind of. Those trim levels seem fairly straightforward, but ordering a Porsche is anything but. Myriad customization options ensure that no two 718 models leaving the factory should be the same. From paint swatches to performance bits, we have our picks for getting the most from the 718. Sport Chrono may be a smart pick for shoppers interested in an automatic-equipped 718. In addition to a dash-mounted stopwatch, Sport Chrono offers a Sport+ setting that dials in more aggressive throttle and transmission behavior, and stiffer ride settings on cars with adaptive suspensions. For manual-equipped 718s, Sport Chrono adds rev-matching downshifts; for automatic-equipped 718s, Sport Chrono adds launch control. We’re sold more on the former—it’s just the right amount of fun to rocket off the line with the car’s help. From there, most of the 718s features are split between luxury options and performance options. High-end audio from Burmeister, leather seating, wood or carbon fiber dash inserts, are all available to make the cabin even nicer. Beyond Sport Chrono, Porsche offers pricey performance add-ons including carbon ceramic brakes ($7,410), torque vectoring ($1,320), and sport exhaust systems ($2,900). The 2018 Porsche 718 draws plenty of miles—and smiles—from each gallon of fuel. Efficiency isn’t the first mission of the 2018 Porsche 718, fun is. Thankfully, it’s pretty good at both. Base versions of the 718 Cayman and 718 Boxster sip the least fuel with an automatic transmission. The EPA rates those models at 22 mpg city, 29 highway, 25 combined. Manual-equipped cars rate 21/28/24 mpg. Stepping up to 718 Cayman S or 718 Boxster S versions adds more power but won’t significantly dent mileage. Those versions are rated at 21/28/24 mpg with an automatic, 20/26/22 mpg with a manual. The new GTS variants are the thirstiest: 20/26/22 mpg with an automatic, 19/25/21 mpg with a manual. 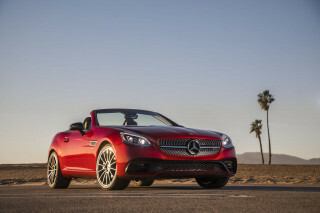 The Mercedes-Benz SLC-Class is rated at 27 mpg combined with a turbo-4, or 23 mpg combined with a turbo-6.